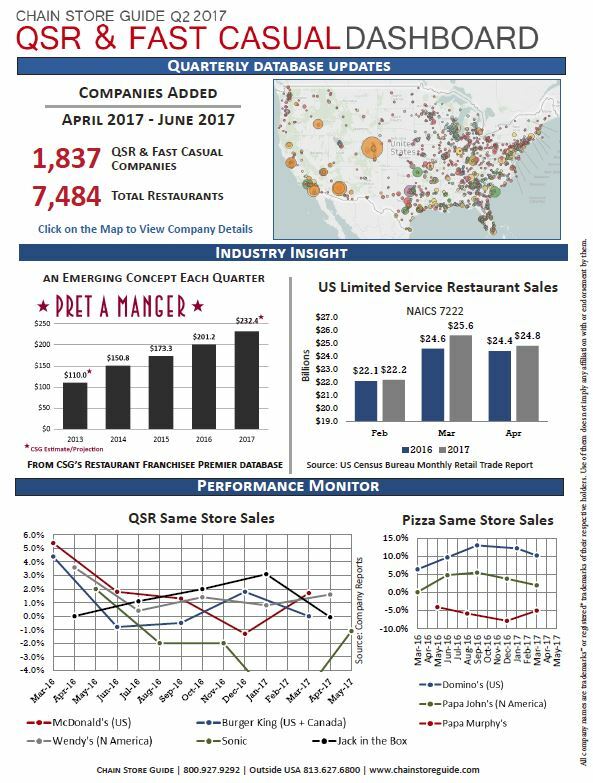 Following up last month’s debut Q2 Casual Dining Dashboard, here’s the newest edition of the QSR & Fast Casual Dashboard from Chain Store Guide. This quarter, we bring you a visual representation of the state of the QSR and fast casual segments with industry sales data, at-a-glance performance data from top chains and a look at a UK-based chain growing its presence in the US and possibly preparing for an IPO. For our current subscribers and clients, we also include a look at the QSR and fast casual companies we’ve added to our Restaurant Franchisee Premier Database in the last quarter.